Welcome to our very first day of school for this school year! We are glad to have all of our kindergarten friends, as well as other students who went to a different elementary school last year, with us today. My name is Mrs. Rahm and I am a secretary in the office with Mrs. Vasill. Your school principal, Mrs. Bryant, is looking forwad to a great year together and we will be joined later by Mrs. Lipstraw, our assistant principal. Here's a note from Mrs. Lorenson - the pencil machine is full and ready to meet your writing needs! Today is "Make You Think Monday." Each Monday I will offer you a riddle, a story or perhaps a short passage from a book. This is meant to make us think, to challenge us on a Monday morning when sometimes we are a little "foggy" after a great weekend (or a wonderful summer break!) Here is today's offering for "Make You Think Monday." 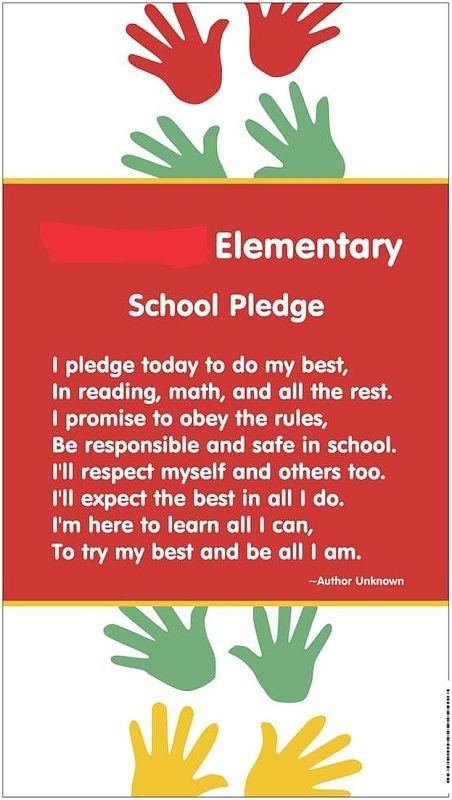 This is called the "Elementary School Pledge." Last but not least, every Monday I will select a Joke of the Day student who will share their joke on Wednesday. I have selected 2nd grader Jack Barron to join me on Wednesday. The Joke of the Day submission forms will be sent out to your classrooms this week. Please send a joke in and you can be on the morning announcements!